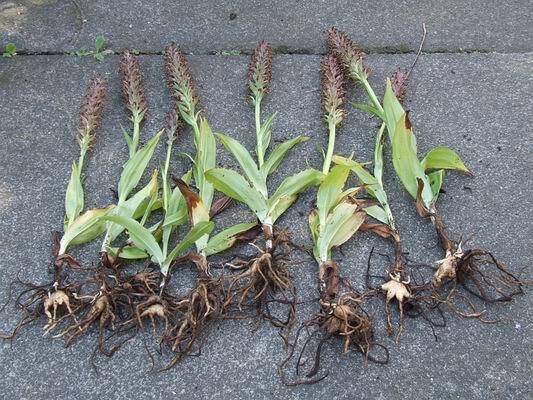 Now, as the flowers have all faded and the seed pods start to swell, is a good time to increase your stock of Dactylorhizas by lifting them very carefully and splitting off the new tubers. If you look you can see the light coloured new bulb at the base of the stem. I would normally expect two new bulbs to have formed, one at each side, but as this pot full was congested and has not been divided for a few years there is only one. Holding the stem at the base in one hand and the new bulb in the other, gently twist in opposite directions and the new bulb will come away - if you have two new bulbs remove them both. If the plants have been growing strongly there are often some smaller bulbs in addition to the two flowering sized ones I would normally expect. Another point I will make from this picture is that as well as using the 10 second delay I should have switched to manual focus. The cameras auto focus sensor has looked past the main subject and has focused on the ground which you can see is perfectly sharp while my hands and the orchid bulbs are a bit fuzzy. I am still coming to terms with auto focus on cameras having used manual focus since I took up photography when I was 12. Here you can see the new bulbs have been removed carefully so as not to damage either them or the old bulb and flowering stem. 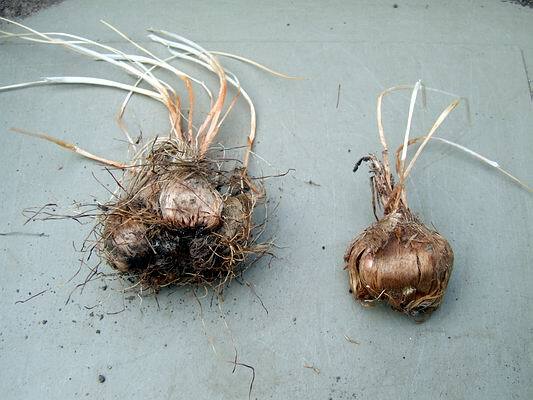 Now you carefully replant the flowering stem and bulb back into a pot or back into the garden bed where you lifted it from, where it will grow on and form another crop of new bulbs before the winter comes. 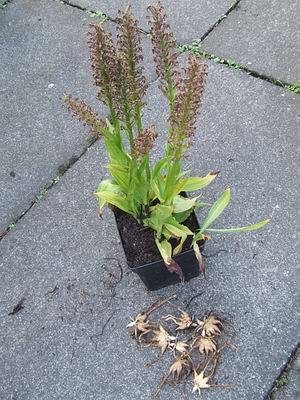 The removed bulbs can be planted to form a new clumps or pot. As a general rule I do this every three to five years with the ones growing in the garden and every second year with the pot grown ones. This gives them a year untouched to build back strength - the split ones have never shown any obvious signs of weakness but asking them to do this extra work every year may make them more susceptible to disease. Now I have decided that repotting is over and all the pots that I have not been able to do will have to wait until next year. 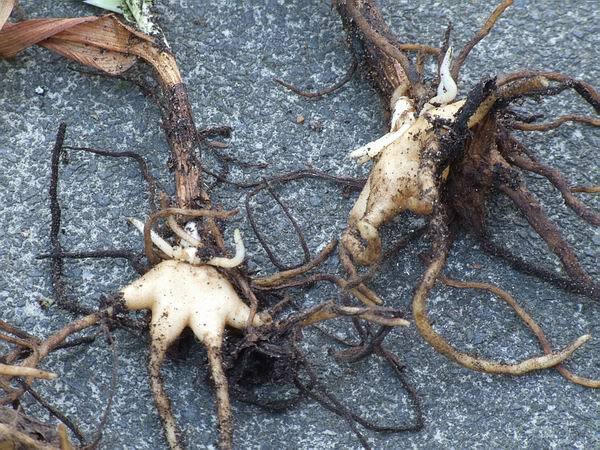 I still believe that it is best to repot every year to both refresh the compost but more importantly to handle and check the bulbs. 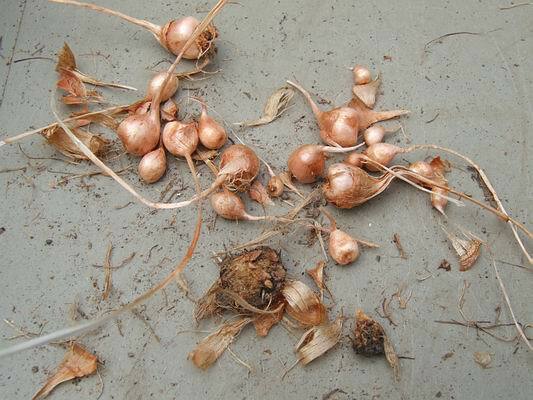 Checking the progress and health of the bulbs every year is the most important reason for the annual repot. If there are problems you can then take the decision to reduce or increase the watering and feeding regime as necessary. 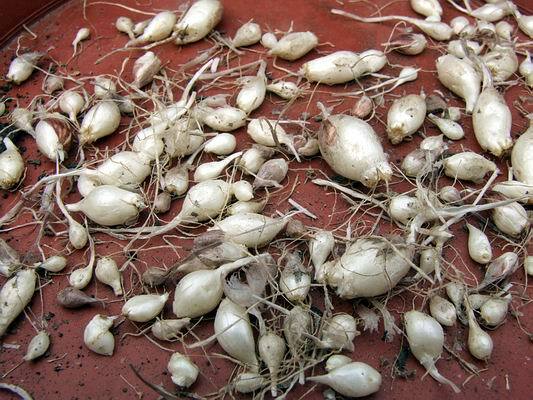 Talking of problems, I always have problems with Crocus sativus. I buy corms and they flower beautifully the first year and then do not come back into flower again. 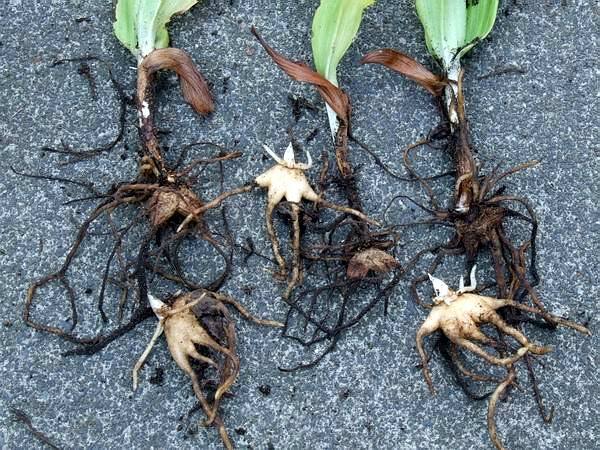 The corms grow on each year but instead of getting bigger they get smaller with each corm producing up to 6 small corms instead of getting fatter. I have tried the often advised method of planting them deeply and this does not work and I have tried feeding them excessively to no avail. My answer is to buy new corms each year; you get huge corms for a very reasonable price and it is the only way I am going to enjoy the flowers. Does any one out there succeed in flowering sativus every year like the commercial growers do? 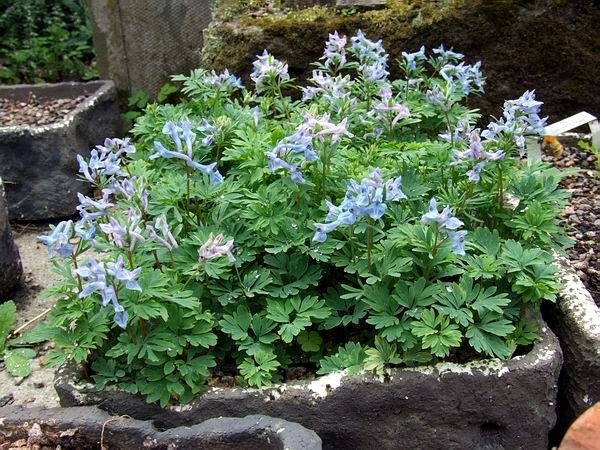 One success is the troughs of Corydalis cashmiriana which I showed the other week. Having given them a dusting with Vitax Q4 fertiliser after they lost their spring growth of leaves a month ago and watering it in well, they are giving the best late summer flowering we have ever had. Normally we get a few flowers per trough but this year there are heaps of them. The one thing that I notice is that the colour is never the beautiful intense blue that they are in the spring but it contains a bit of red making the flowers slightly purple blue. They are still very welcome at this time of year when we do not have so many bulbs in flower. Again I am not the only one enjoying the flowers as the bees are attracted by them as well. However as I take pleasure from these bonus flowers the bee gets frustrated as he cannot find the way in to the pollen and nectar rewards. 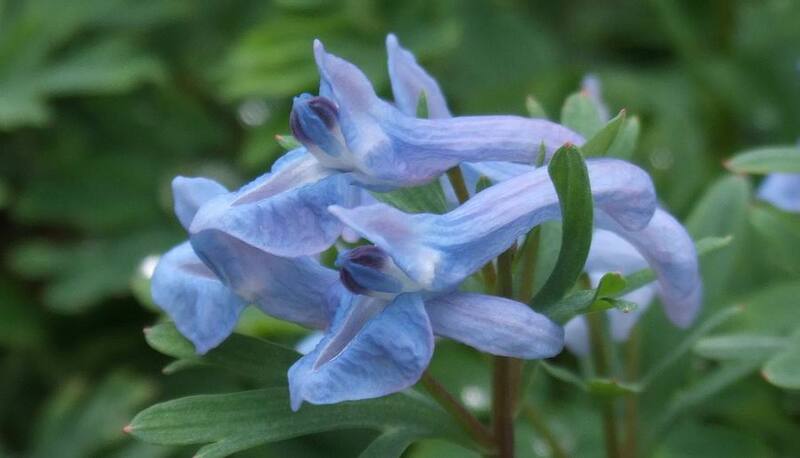 I always advise you to pollinate your corydalis by hand if you want to get seed as I do not believe that we have insects that are capable or know how to pollinate them. I did observe the bees in the spring to see if they could pollinate the corydalis flowers and was witness to this smash and grab. The bee chewed a hole through the back of the spur to get at the nectar without serving the plant at all. I am off to Oslo on Friday to talk at the Blomstervenners Klubb's weekend conference; I hope to see some of the Norwegian bulb loggers there - my subjects are Erythronium and Fritillaria.